Skincare FAQs: Is Microdermabrasion The Right Way To Exfoliate? Let's Find Out! I never realized how important it was to exfoliate until I ended up with dull, lifeless flaky skin. No matter what I did and what I applied, it still looked lacklustre. The solution was simple, exfoliation. Unfortunately, years of neglect and lack of proper skincare combined with the perils of our polluted lifestyles settles into the cracks of your skin. Just as you bathe and brush daily, regular exfoliation is as important. If dull skin, flaky skin, blackheads, clogged pores, fine lines and uneven pigmentation sound like your problems; microdermabrasion might be your solution! Performed at your dermatologist, microdermabrasion is exfoliation's bigger brother. It is performed using a tool that uses tiny exfoliating crystals or a diamond tip. The procedure exfoliates and gets rid of the top layer of dead skin cells. 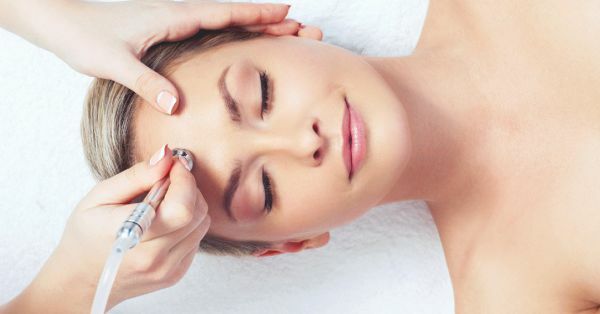 Through a series of treatments usually performed a few weeks apart, microdermabrasion can help buff and polish your skin giving you a glow, easing the appearance of lines and wrinkles and cleansing your pores of all the dirt clogging it. Microdermabrasion is an effective way to exfoliate at a deeper level. While the procedure is expensive, it may be worth discussing with your dermatologist if it is really right for you. Is there any recovery time or post-procedure care? Not really, your skin may be red for a few hours post-procedure. It is advised to moisturise regularly and wear your sunscreen. Your skin may tend to be a little flaky a few days post procedure but that's totally normal. Just apply more moisturiser. But how much is too much you wonder? If you're using a scrub at home to exfoliate your dull and dry skin, once or twice a week is recommended depending on your skin type. If you are going to get professional microdermabrasion treatments, typically every 3-4 weeks is recommended. Not prepared to pay the price for professional microdermabrasion? Don't worry. There are a few at-home products that can help you exfoliate your skin better than a regular scrub. Let's find out what's right for you! The Body Shop Vitamin C Microdermabrasion (Rs 1,595) - Brighten! Kiehl's Epidermal Re-Texturizing Micro-Dermabrasion (Rs 3,500) - Texture no more! Votre Microdermabrasion Scrub - Spa Exfolient (Rs 1,450) - Glow all over! O3+ Micro Derma Brasion Facial Peel (Rs 2,100) - No scrubbing! Still not sure why you should be exfoliating? Check this out.